Razer (HKG:1337) is an interesting and in several ways unique company. Founded on the basis of the humble mouse by an ex-lawyer who is also a gamer (Min-Liang Tan), the self-anointed “leading global lifestyle brand for gamers” went public to much fanfare in late 2017 on the Hong Kong Stock Exchange. Since then however, the stock has endured a significant decline with an initial offering price of HKD3.88 soaring to HKD5.49 before beginning a long and slow gradual decline, albeit some of that came in the Q4 tech stock bloodbath that hit at the end of 2018. Things seem to have bottomed out around the end of 2018 (at a little over HKD1) however and in Q1 2019, the stock has seen some mild growth as both the US – China trade war has reduced in intensity (something to which Razer is likely exposed along with most tech companies given the likely Chinese manufacturing it relies on), along with an expectation that the company is probably starting to “grow up” a bit and look towards its path to profitability. The IPO publicised several key areas where the firm would be looking to invest the cash it raised and it’s clear to say that it has experimented with mixed results. That much said, Razer still has ample cash reserves and will likely be buoyed its ability to identify underperforming initiatives and cut the cord where appropriate (yes I’m looking at you Razer Game Store). 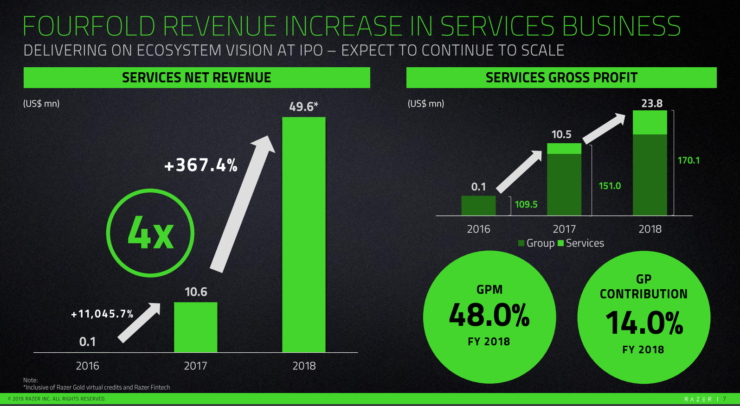 Revenue growth of 37.6% (a 3 year high) hitting US$712.4m. Services business growth at 367.4% (in the official figures although by my calculation the percentage actually comes in at 367.9%) to come in at US$49.6m, up from basically zero in 2016 with a stonking gross margin of 48%. Net loss massively reduced from -US$165.8m to –US$97.9m. 29.4% growth in peripherals and systems net revenue to US$615.5m. Systems gross margin hits 9.4% which while low by many business standards, in the PC systems business where margins are razor (hoho!) 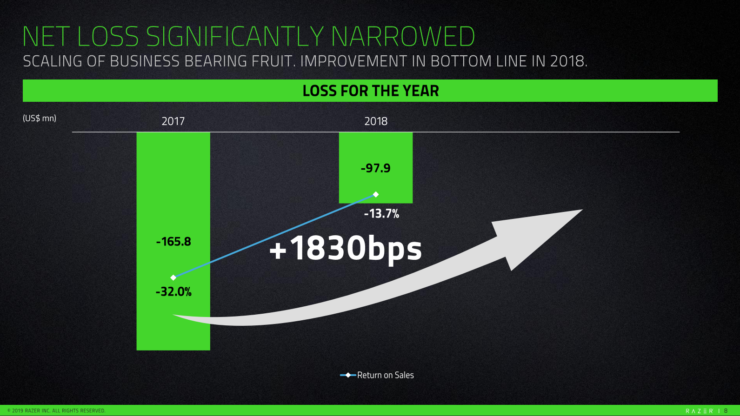 thin as a matter of course, the fact that Razer has managed to eke out its margin this much is a significant win given that when the firm IPO’d, its Blade line of laptops was barely scratching profitability with a 3% margin. Razer also cites my review(!) in its earnings referring to the “grand slam of a 10/10 score and the Editor’s Choice award” we gave to the Razer Blade 15 Advanced with RTX graphics, noting that it claimed the number 1 spot on Amazon.com as the best-selling RTX-equipped gaming laptop since launch. 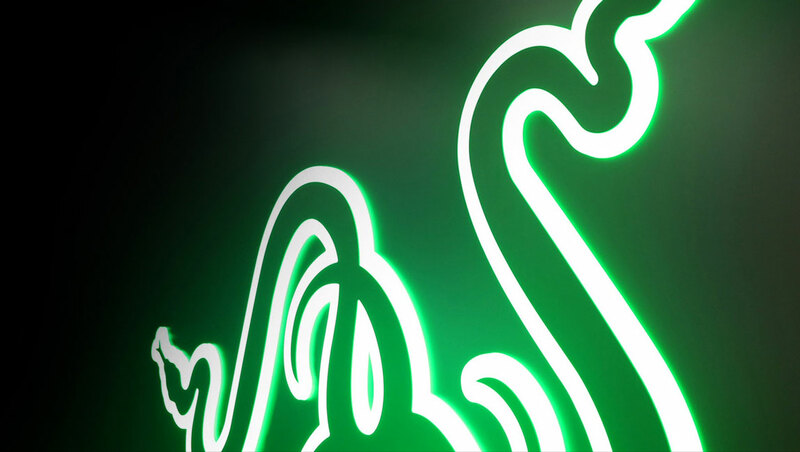 Razer isn’t what most people would traditionally consider a fintech business, but despite the shock resonating throughout the financial industry, it has waded in to payments in a big way with its acquisition of MOL Global and ramping up of Razer Pay, what it is referring to as one of the largest offline-to-online (O2O) digital payment networks in Southeast Asia, handling US$1.4 billion in payments in 2018. 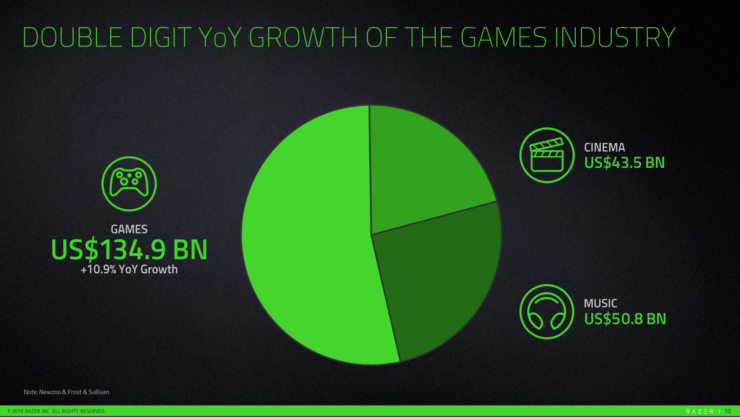 The Razer software ecosystem meanwhile has grown to ~60 million registered users as of 28th February 2019, although the activity and monetisation rates of those users isn’t made clear. Peripherals of course are what Razer is most known for and the revenue powerhouse segment contributed US$429.6m in revenue for 26.8% year-on-year growth with a nice, healthy gross margin of 32%, although margin was slightly down here from 2017 where it scored 35.5%. Financial earnings meanwhile increase significantly from US$2m in 2017 to almost US$12m in 2018 due to the company having significantly more liquid assets to invest as a result of the cash raise from the IPO of course. Cash and equivalents now sit at a little over US$615m, down from almost US$740m a year earlier with most of the decrease being attributable to the acquisition of MOL Global, tax payments on restricted stock and also a share buyback (more on this later). It’s only natural that a company with a massive war chest and an inkling to expand outside of its peripherals niche would have some mediocre moments and a couple of not so great periods have come in the last year. Chief amongst them is the Razer Game Store which existed for a grand total of 10 months before being ignominiously shut down in February “as part of the company’s realignment plans”. Realistically, gamers have enough ways to buy games between Steam, Origin, Uplay, GOG, Epic and who knows how many other PC platforms. Was Razer really ever likely to add significant value to this are for gamers? Unlikely and even if it had thought it would, the likely long hard slog to get the business unit to profitability contributing any meaningful revenue numbers was probably enough to put it off. Partnership with other major companies (Tencent) is probably the better way to go on this front then (more on this later). Then we come to the Razer SoftMiner. Razer’s (probably ill-fated) attempt to get in on the crypto-boom with a twist: Run a piece of Razer software to use your gaming rig’s power to mine Razer Silver credits for putting towards Razer gear. Obviously somewhere down the line, there’s a provider who is turning the work your PC is doing into some kind of cryptocurrency and the trouble here is that even at the ridiculous lows crypto has fallen to since its high at the end of 2017, the rewards you’re going to get out of the Razer ecosystem are effectively giving you an eye watering exchange rate. I get it, some people don’t want to go to the trouble of setting up their own mining software etc and the Razer solution offers a pretty turnkey method to monetise spare cycles from your PC into cash but it would be hard to recommend this to anyone other than a user who is maybe a few points away from that Razer keyboard they wanted and impatient to get there. Gamer and media backlash has been present and it will be interesting to see if the SoftMiner remains or disappears quietly into the ether over time too. Razer basically created the modern day gaming phone niche (no, I don’t count the old Nokia N-Gage!) 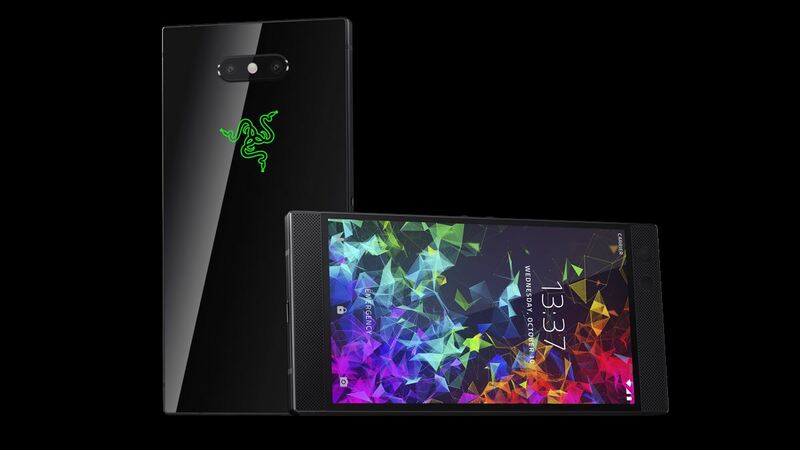 and although it is well received and has spawned clones since the original Razer Phone launch in 2017 (and the subsequent Razer Phone 2 in 2018), the jury is still out on whether this was the smart way to go from a revenue perspective given that the “Others” segment where Razer lumps its phone revenue only grew by 50% from 2017. Before you say “wow, it grew by 50%, that’s great isn’t it? ?”, it’s worth delving a bit into the analysis I did previously here. March 2018 full year earnings for the “Others” category included basically 2 months of sales and clocked in at US$31.6m because the original Razer Phone only launched in November 2017. The latest set of numbers basically gives us our first look at a full year of Razer selling a mobile device and the final tally only comes to US$47.4m. Even if we assume a best case scenario for the Razer Phone 2 (unrealistic given that Razer notes this revenue is from continued sales of the RP1 and initial sales of the RP2) and allocate all of that money to the second iteration rather than any to the first, with a launch price of US$799, that still only equates to a little under 60,000 units shifted. An improvement on my estimate of 45,000 units of the original Razer Phone for sure but not a number which is going to set the smartphone world quaking in its boots by any measure. 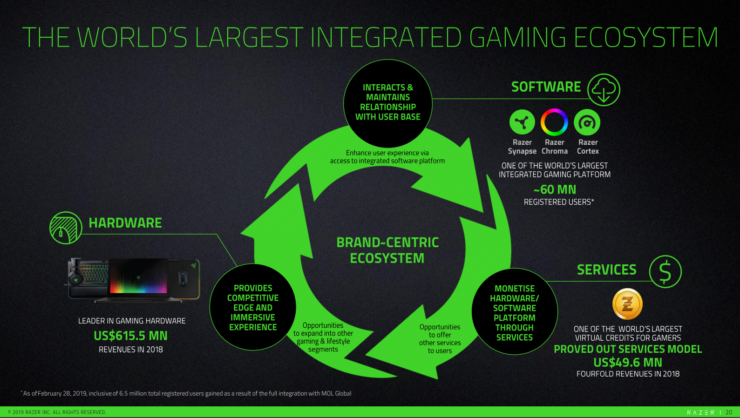 Here’s hoping that Razer doesn’t abandon the hardware niche it created as I personally am a big fan of its mobile devices, but a newly announced mobile gaming collaboration with Tencent may see the focus shift from hardware to software, ecosystem, discovery and monetisation. The other area which is slightly clearer, but still unclear to my mind is the Razer move into the fintech space. Razer is undoubtedly a massively recognisable business from a gaming brand perspective but those of us with a background in finance know that the business is fraught with serious pitfalls, particularly given both the global and the heavily regulated nature of finance. Operating in a couple of countries with light touch regulation is one thing but shifting this ecosystem beyond Southeast Asia in a significant and meaningful way will take a lot of investment. The segment is probably the star of this set of earnings for Razer and by the look of things will be able to pay for its own expansion, Singapore however has been pushing the digital friendly revolution in payments but is still something of a laggard when comparing to countries like Sweden where just 1% of payments are made using cash. Razer obviously seems well placed both geographically (with one of its two global HQs being based in Singapore) and appears to be politically well-connected so it’s possible it can make significant inroads here. 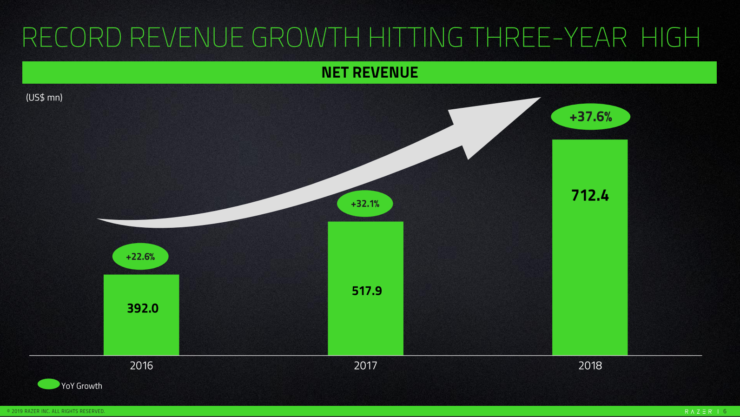 There’s a lot to like in Razer’s full year report. The company obviously believes in its business plan and value proposition with its $16m share buyback in 2018 although it’s difficult to see how it didn’t make sense to buy some stock back given it sold at HK$3.88 and likely bought back at significantly below that, given the low watermark of about HK$1. Some of the initial retail investors who bought in at the IPO in a frenzy may not be so happy to learn about that but that’s business. The Services segment is undoubtedly the star of the show from a financial perspective although it’s worth keeping in mind that bigger companies than Razer have bitten off more than they can chew when getting into the world of finance and been seduced by the seemingly huge profits to be made, only to come away with burnt fingers. The feeling I have is that as long as the company continues to stick to its “For Gamers, By Gamers” mantra, it will continue its growth and keep its heart in the right place. With its charismatic CEO at the helm (an avid gamer as most who follow the company know) it seems unlikely to go too far wrong.